Healthy productive pastures can be a great source of nutrition for your horse, reduce your hay and grain bill by hundreds, if not thousands of dollars, and are great for the environment because they anchor soil and prevent nutrient and soil run-off. An unproductive pasture is one that is weedy with lots of bare soil (Figure 1), whereas a productive pasture has a dense, thick stand of healthy pasture grasses (Figure 2). Figure 1: An unproductive pasture is one that is weedy with lots of bare soil. Keep in mind that not all horses can be allowed unlimited grazing on pasture, but for those that can, pasture can meet nearly all of their nutrient requirements and provide a great place for exercise and socialization. Here are a few simple steps you can follow to make sure you get the most out of your horse pastures. One of the first steps to enhancing your horse pastures is to make sure the soil has enough nutrients in it to feed the plants, and that the soil is not too acidic. The three main nutrients of concern are nitrogen, phosphorous, and potassium. The ideal pH for pasture grasses in this area is 6.2 to 6.5. The best way to tell if your soil nutrients or pH need adjustment is to send a soil sample off to a certified soil testing lab. To learn how to properly take a soil sample and for a list of certified soil testing labs, visit https://extension.umd.edu/horses. Figure 2: A productive pasture has a dense, thick stand of healthy pasture grasses. A soil test will tell you if you need to apply lime to raise the soil pH, and how much is needed. It will also tell you how much nitrogen, phosphorous, and potassium should be applied to the pasture each year and when to apply it. If you don’t have the equipment to apply the lime and nutrients, there are many agricultural service providers that specialize in those applications. Once the soil nutrients and pH are optimal, soil tests only need to be done once every three years. The $20 you spend on a soil test can save you a lot of time and money because you will only be putting down nutrients and lime if they are truly needed. You are also saving money in seed because if you apply seed to a soil that doesn’t have optimal nutrients, the seed may not germinate and grow. The next step to a productive pasture is figuring out whether you need to completely start over with a full renovation, or if you can salvage what you have and improve your pasture management. The way to do this is to assess your vegetative cover which involves determining how much grass, weeds, and soil you have out in your pasture. It sounds complicated, but it is relatively easy to determine, and the University of Maryland has a video on just how to do it: https://youtu.be/lDY7lGT6fU4. In brief, you randomly walk around your pastures, stopping every so often to look down to see what a pre-specified area on your shoe is standing on. Using a piece of paper, you can track whether you land on a grass plant, weed, or bare soil. Count up how many times you landed on each of those items and then divide by the total number of stops you made. If the percentage of grass is less than 50%, it’s best to kill off all of the vegetation and establish a brand new pasture. If the grass percentage is 50-70% than a partial renovation using good pasture management and over-seeding is recommended. If the percentage of grass is greater than 70%, it is recommended that good pasture management practices be continued to maintain it at that level. 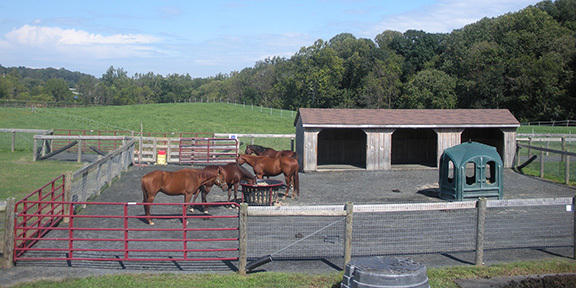 The Maryland Department of Agriculture’s Horse Outreach Workgroup has some fantastic articles on how to re-establish a pasture from scratch and the proper grass species to use. 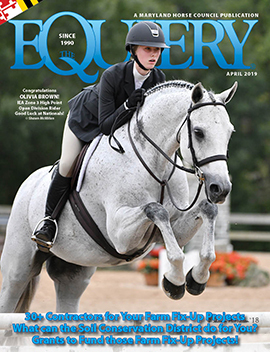 You can visit their website or find the articles on the University of Maryland’s website at: https://extension.umd.edu/horses. Regularly mowing your pastures to a height of 4-6” is one of the most important steps of pasture management. Mowing helps to control weeds by cutting down their seed heads to prevent further spread. It also trims down weeds with broad leaves that are shading out grasses underneath them and competing for resources like nutrients. Avoid cutting grasses below 4” because the plants store their energy for growth in the bottom few inches of the plant. A key to controlling weeds is to promote grass growth through maintaining good soil fertility and mowing. Also, it is a good idea to walk your pastures several times each year to try to identify what type of weeds you have. Many weeds are non-toxic and can even provide some basic nutrients to your horse. However, there are plenty of toxic weeds out there that could cause your horse to become ill. There are numerous resources online to check what weeds, shrubs, and trees are toxic to horses. If you have a good bit of weeds and/or some of them are toxic, make sure you identify what you have first. You can visit your University of Maryland Extension office in your county to get some assistance with weed identification. Once you know what you have, you can choose a herbicide that is effective against the weeds that are present. If you do not have experience with herbicides, consider hiring a company that specializes in herbicide application on horse farms. Make sure to pay attention to the label and only use herbicides approved for use on livestock pastures. Pay attention to the grazing restrictions to figure out how long after application your horses can graze the pastures again. Horses create bathroom areas in the pastures that are full of manure and urine spots. Those areas quickly become weedy, overgrown, unproductive parts of the pasture. To turn those areas back into productive pasture that horses will graze, it is important to drag the manure around the pasture to break up the piles and spread the nutrients. After all, manure is a great source of organic nutrients because it contains nitrogen, phosphorous, and potassium. After spreading the manure, make sure to mow the entire pasture to 4-6’’ to help knock down the tall weeds and grasses that were in the bathroom areas. After a nice steady rain and a little bit of rest, those bathroom areas will be regrazed by horses. If a lot of horses are on a pasture, it is a good idea to drag each time the pasture is mowed. When horses are allowed to graze down pasture plants to the ground or nearly so, they strip the plant of its ability to regrow. The plant stores its energy in the bottom few inches so once the energy is gone, the plant must rely on its root systems to grow. Constant overgrazing leads to week roots and ultimately death of the plant. Once the plants die, opportunistic clover or weeds encroach into the area. A general rule of thumb is to let horses graze plants down to no less than 3’’ to avoid weakening the plants. 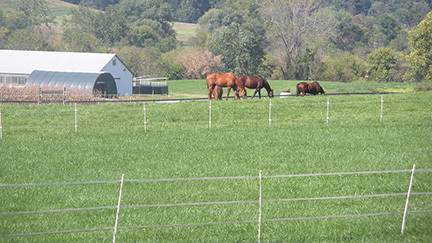 Figure 3: Strategically rotating a herd of horses through smaller, rested pastures can keep pasture plants viable for years and years. Plants need rest just like humans. When pasture plants are allowed to rest and regrow, their root systems become more dense and strong and the plant remains viable for years and years. Once horses graze the pasture down to 3’’, it is time to move them off to another pasture so that the plants can rest. Most pastures should be rested for about three weeks before they are grazed again. Strategically rotating a herd of horses through smaller, rested pastures can keep pasture plants viable for years and years (Figure 3). In rotational grazing, horses are moved onto pastures after they have rested up to 6’’ in height, and then they are moved off that pasture when they have grazed it to 4’’. If another pasture is not available, horses are moved to a loafing lot as in step 8. Damage to pastures and soil occurs when horses remain on pastures during inclement weather including snow, rain and drought. One way to preserve a productive pasture during those times is to build a loafing lot adjacent to the pasture where horses can be temporarily housed. 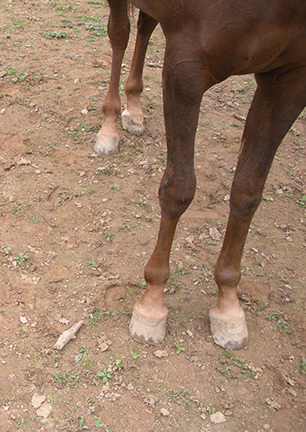 Figure 4: Loafing lots are well-drained areas of land at least 600 square feet per horse that contain shelter, hay and water sources. Loafing lots are well-draining areas of land, at least 600 square feet per horse, that contain shelter, hay and water sources (Figure 4). Using a loafing lot is also helpful when pastures are being dragged, mowed or fertilized. Keeping too many horses on a small plot of land will most likely result in a bare dirt lot (Figure 5). If maintaining a productive pasture is a priority, then each horse should have at least 1.5 acres of pasture during growing season. If less grazing land is available, horses will not be able to remain on pasture for the entire day, or horses need to be rotated through a series of smaller pastures more frequently so that pasture grasses can rest. Productive pastures are possible with a higher stocking rate, however the farm operator must use a high level of pasture management. Figure 5: Keeping too many horses on a small plot of land will most likely result in a bare dirt lot. If a full or partial pasture renovation is needed, make sure to buy seed that is a forage-type variety that has been developed for pastures, not for lawns and athletic fields. 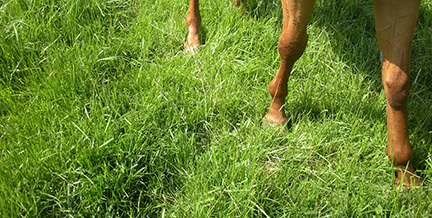 Many companies sell pasture mixes especially for use in horse pastures. Species like tall fescue, orchardgrass, bluegrass, and white clover are all well-suited to growing in horse pastures in this area. If you have broodmares, select a novel endophyte tall fescue that will not negatively impact her reproductive performance. Pasture species to avoid in horse pastures include timothy because it does not withstand heavy grazing, and red clover because it can cause slobbers in horses. Follow these 10 steps and your pastures should be well on their way to becoming more productive. If you need additional assistance, seek out the extension agent in your county or the local conservation district. Both provide free consultations to horse owners regarding pasture management. About the Author: Dr. Amy Burk is an Associate Professor and Coordinator for the Equine Studies Program at the University of Maryland. She operates a rotational grazing demonstration site that is used to teach horse farm operators how to better manage their pastures for the health of their horses and for the environment.